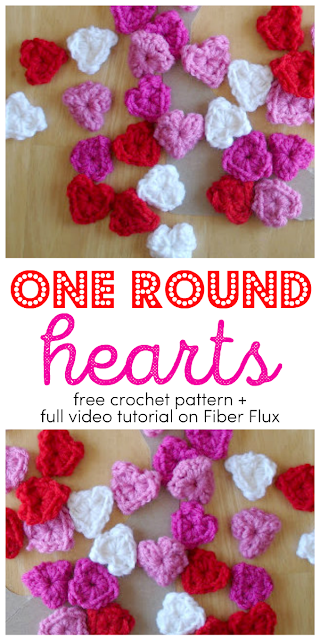 Fiber Flux: Free Crochet Pattern...One Round Hearts! Free Crochet Pattern...One Round Hearts! 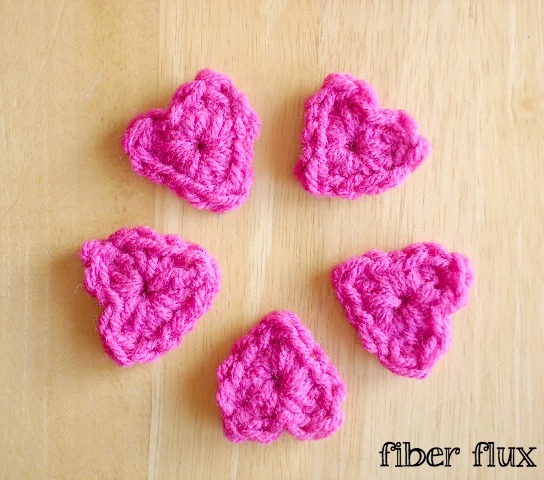 Using minuscule amounts of yarn, these sweet little hearts work up super fast in just one round! Make up a few for a garland or create a shower of them for a window. Tuck one or two in a loved one's lunch or jacket pocket. A fabulous beginner project to learn an array of stitches! Mix it up with tiny stars! Worsted weight yarn ( I used Red Heart Super Saver in "Shocking Pink" "White" and "Cherry Red"
Round 1 (work all stitches into the ring): dc, tr, dc, sl st, dc, tr, dc, sc, sc, sc, tr, sc, sc, sc, join to close heart and fasten off. ...join to close heart and fasten off. Aw I love these so much!!!! I love these! I used a magic ring as a start and it came out just as cute. Thank you for sharing! where are you doing these 14 stitches you have listed? There's only a chain 4. 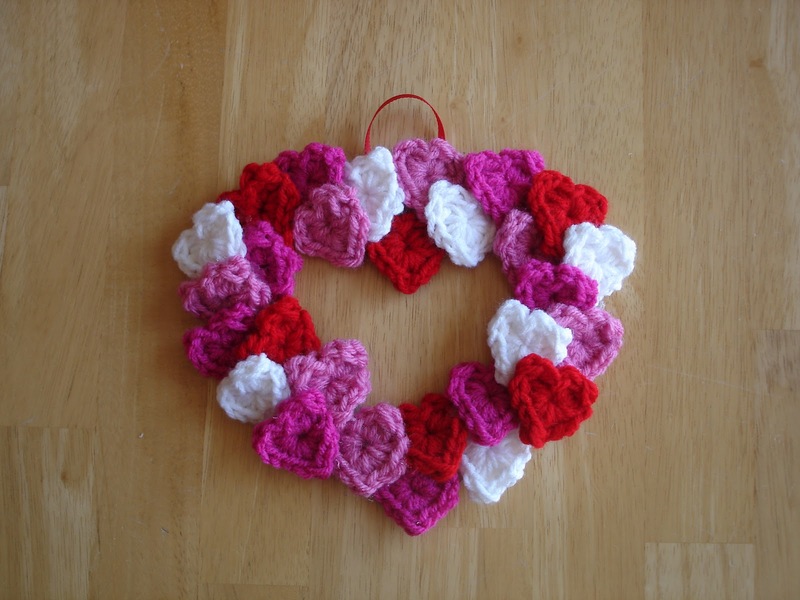 The hearts are made in the round, so the chain 4 is joined to make a circle and then round 1 of the instructions are done through the middle of the circle, similar to the way a granny square is constructed. Hope that helps! Looking for a heart pattern for my crocheting project, I have come here. Thank you for sharing your pattern. It works very well. Exactly what i was looking for, thank you very much!!!!! What do you put the hearts on to make the wreath? I teach First Grade and woudl LOVE to put this on my door! Thanks anonymous! The link is helpful...actually I mounted mine on a recycled cereal box. So simple! 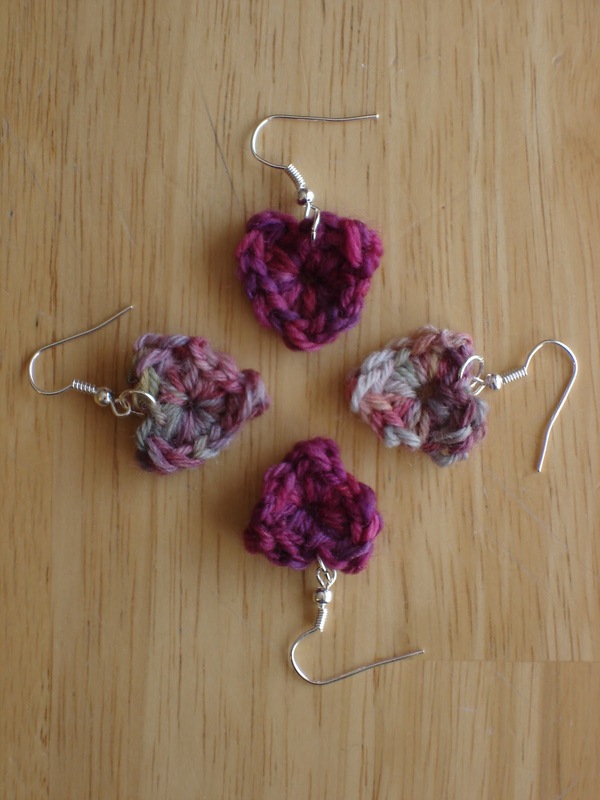 I'm trying to make the heart earrings and I'm sort of a beginner at crochet. I made this but it turned into an "8" figure and not a heart lol! Is there any way that you could make a video for this pattern? Or if you have any tips on how to master it? Thanks so much!! Sure! I haven't done videos yet, but I could do a step by step of the heart, that would be fun! I just got the email with the blog post in it and I was so happy when I saw that you posted it because of my comment!! Thanks you so so much and I really appreciate all your lovely patterns!! God bless! Yes! You definitely inspired that post...thank you!! where r your crochet hats and flowers u need some. Your little hearts were a huge hit at a Valentine party I went to. I put a few on a gift package and the ladies all loved them! They want me to make some shamrock pins for them. Do you have a pattern? I made a bunch of the chunky hearts with 2 strands of a fluffy red and 1 strand of metallic sparkle. I added pins to the backs and they made wonderful accents for the chemo hats we're knitting. I love your single round patterns. I can make great pins out of them for our hats too. Doing the flowers in cheery colors makes them so much fun and they can be mixed and matched on hats when the wearer wants a change. Thanks for some great patterns.